The holidays sort of meandered this year with Jane’s Birthday kicking them off, Stepdad three days later Mom the following week and Mr. G a week after that. A week later we had Thanksgiving and Chanukah all rolled into one and to be candid by the time your Christmas rolled around I really couldn’t bring myself to care about one more candy, cake or fried thing. One of the nice things about the women I’ve surrounded myself with is their ability to give. It’s not their fiscal ability it’s the openness of their hearts. Bloggers see this on the web as my friend Heather supports parents in the NICU and Kim Prince has made it de facto that Mom Blogger events in LA support HAMO and you show up with your pack of diapers. Sometimes, though, it’s really nice to see and feel and touch the things you’re giving. I’m happy to give cash to worthy charities but the best giving comes every December when my friend Elizabeth sends out this letter. Lets keep this tradition going, please. We are preparing for the annual Christmas Wish drive for the children and mothers staying at the shelter for women and children of domestic violence. A charity program we started 17 years ago (boy, does time fly).There are 12 families this year with approx. 40 kids and 12 mothers. The past 16 years have been TRULY incredibly successful thanks to all who have participated. We’re very serious when we say that this could not happen each year without the help and generosity of so many people! Christmas morning is truly magical when they awaken to a tree full of gifts that they wished for. The children are very grateful, as are their mothers and the Sisters that run the shelter. We would like to continue our efforts in bringing Christmas to the families at the shelter. (Each year different families arrive for protection and rehabilitation). The children and mothers have already put together the lists, which we are prepared to hand out within the next two weeks. We know it seems early (actually, never too early for kids) but we’d like to get you a wish list before Thanksgiving in order that you feel you have time to participate, and can take advantage of the holiday sales. If you would like to participate, please let us know and we will get a list to you. We are very sensitive to the economic times and the burdens we have all been facing, so those wishing to group together to purchase a gift are very welcome. P.S. For those that are new to this charity, below is some information on the shelter and the Christmas Wish List Benefit. This is a shelter for women and their children that suffer from domestic violence. The shelter’s campus has apartments that house up to 12 families, a school, common areas to eat, play, and socialize. The shelter also offers job training, medical treatment, and legal services. The families stay for a year, because the philosophy of this shelter is to aim toward complete rehabilitation for the families in order that when they leave they are able to begin a new life in a successful manner, and free of violence. The shelter is completely privately funded, thus relying on community support. All services are donated. It’s a pretty amazing place; and what they have achieved over the years brings a truly positive spin under very difficult circumstances. Their success rate is 98%! We started this Christmas Wish List Benefit 16 years ago asking each mother and child to put together a list of 5 things they each wished to receive on Christmas. The idea was to bring Santa into each home giving them exactly what they asked for since these families had never experienced Christmas in this manner. In the beginning, the hot items were hand-held televisions and Nintendo. Over the years, however, it has evolved to 3 gifts on each list. They’ve asked for electronic games, bikes, a variety of princess stuff, skateboards, scooters, dolls, balls, and all sorts of games (generally things our children ask for). The moms have always asked for more practical things like pots and pans, but we encourage them each year to request at least one personal gift (perfume, watches, cameras). Over the years, those that have participated really worked hard to ensure that the gift was exactly what was on the list. Many drove far and wide to achieve this, and these people are forever grateful. Each participant is given the name of the child and their age, which makes it quite personal and an item the child or mother has on their list. In the beginning they shared Christmas morning together in a huge common room with one big tree. Beginning with the second year we’ve supplied the shelter with enough trees and trimmings so that each family could share Christmas morning in their shelter apartment with their families, which is what they continue to do. We give them disposable cameras for them to capture the moments. One year we took it a step further. We bought 1 to 2 gifts for each child and mother from the 3 on their lists, then collected money so that the mothers could buy their children the other item(s) on the lists. We wanted to bring the mothers into this excitement and have them be a part of bringing Christmas to their own children. The mothers went out on shopping sprees on 2 occasions to get the remaining gifts and had a ball. It was the first time they were able to do this for their children and they couldn’t thank us enough for the experience. 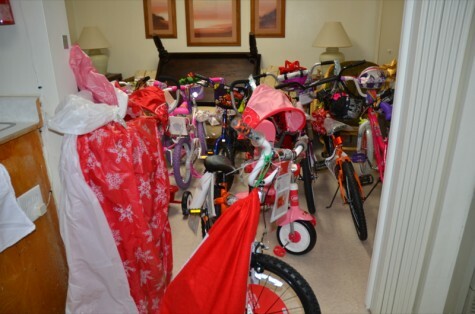 Over the past 16 years we have brought Christmas to approximately 180 mothers and 815 kids — over 2,900 gifts! And they are still talking about it. Small gestures go a very long way. As you might imagine this is my very favorite shopping trip of the year. I never care how much we spend or how many stores we need to visit to buy these kids gifts from Santa. I’ve never celebrated Christmas and Hanukkah doesn’t have the same sort of frenzy but I love that Elizabeth thinks enough of my family to include us in the gifting. This year it was a little tight and friends near and far kicked in with gifts for the moms and the kids. We had boots from Zappos and iPods from New York, there were checks from Arizona and late night drives to Long Beach. Everyone loved giving. We all had fun and when gifts were just too pricey two of us shared the cost and got it done. Many of you emailed me wanting to send gifts but Elizabeth & Nina had already filled the shelter list. Similarly my friend April has a family member who lives in a group assisted living home for men with schizophrenia here in LA. We were talking the other day about mental illness and how it had taken this person that she loves and who used to interact with her and turned it into a one way relationship. She visits weekly but the other men at the group home don’t have an April in their life and she noted that Christmas might be a lonely event. In addition to a lack of gifting they’re all living on disability so there is no extra money. April used her Facebook page to ask friends for gifts for the men and their caregivers. On short notice she was able to provide new toiletries, underpants, socks and tees for the men in addition to used clothing and one person provided a $25 gift card to each of the 11 men which she describes as “overly generous but appreciated none-the-less”. April was also able to gift the mens’ caretaker with some clothing. She lives at the house and provides meals, medication, cleaning, laundry, shopping for food, and general care. A relief male who takes over 4 days a month was also gifted some new clothes and these were the first gifts they’d ever been given. I don’t know what April or Elizabeth might do during this calendar year. I’m not sure that I won’t adopt a charity and ask for more of all of you. I know that we all give pragmatically. I’m never going to show up with a gift wrapped iPod and drop it off at KPCC but I’ll send them a check and take my tax deduction. There’s a joy in giving directly that I’d like to share with all of you. If you want to be contacted next year when Elizabeth and Nina need gifts for the shelter or in the summertime when there are new faces greeting April in the group home just leave a comment here and I’ll have your email address (it’s never public) and I’ll pass it along to these remarkable women. Who knows, I might have something of my own planned. Because gifting is the most fun that anyone can have. I love everything about this. Definitely add me to your list. This is the nicest thing: “I love that Elizabeth thinks enough of my family to include us in the gifting.” To consider it a privilege to be asked is a wonderful way to look at it, vs. seeing it as a burden. If you’re open to other giving opportunities in addition to these excellent ones, give me a holler–I like to connect great people and the nonprofit I work for (and the ongoing needs of the kids and families we support). Giving is the BEST. I would love to be included in April’s group. If you are looking for a great organization to give to, which supports children often forgotten, you can check out http://www.AFCAids.org. I loved this post.